Green smoothies can be a great way to nourish your body with important nutrition needed by your body. 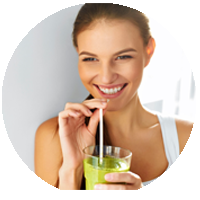 The simplest way to make sure you make the healthy smoothie is by decide by yourself the actual ingredients that you will put on your smoothie. After all make green smoothie is very simple, you just need a blender, green vegetables like kale, spinach, etch, and maybe some fruit in addition plus a base such as water, milk or yogurt. Making your own smoothies can help prevent fruit from going to waste, while providing amazing benefits that should keep you on the right track in direction of achieving healthy body.